Satsangis in Delhi and surrounding areas had planted a thousand trees under MyTree/ Maitri initiative a year ago and a symbolic walk was led by Sri M to mark the event. 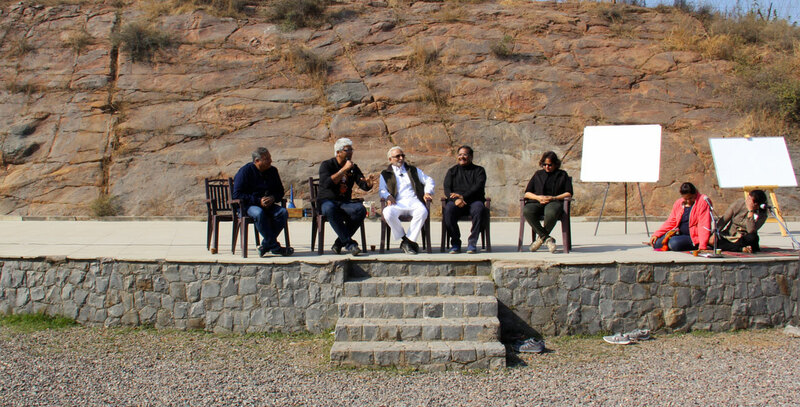 Everyone gathered at the Amphitheatre at the Park where a scroll had been set up for signatures and messages on the initiative. At the other end of the Amphitheatre, hot tea was being served in little clay cups, with instructions not to discard them, but to use them to plant seeds of fruit trees. 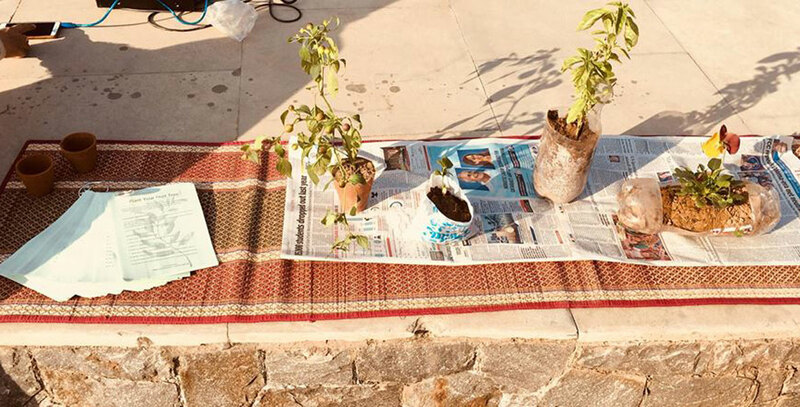 A display on the side showed how waste plastic packets, bottles and clay cups could be used to plant seeds, along with takeaway instruction leaflets. A board with media clippings on the initiative was also put up for visitors to read. 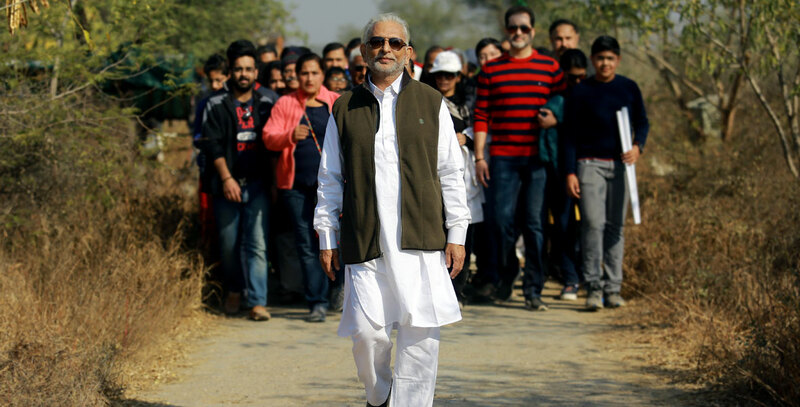 As soon as Sri M arrived, people joined him for a walk through undulating pathways amidst the cries of peacocks and thick undergrowth to the area where the trees were planted. The brambly undergrowth had surrounded the trees that had all firmly taken root and were pushing their way through. 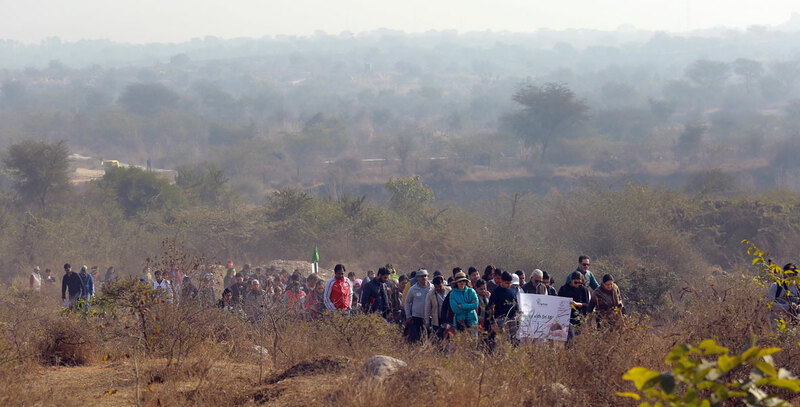 The walk ended at the Amphitheatre where Sharat Bhattatiripad of Fever FM104 awaited to speak with Sri M and Peepal Baba or Sri PremP arivartan, who is responsible for planting nearly 10 million trees across the country on his own initiative. Peepal Baba said, “When one tree is cut, one human being also perishes”, pointing to the disastrous effects of chopping trees on the ecosystem. He warned that the world was doomed to extinction by 2030 if trees kept being cut at the current pace. Also present on stage was Nidhi Kankan, team member of I am Gurgaon, a citizens’ initiative to make Gurgaon a better place to live in. MyTree/Maitri has worked in partnership with I am Gurgaon on the tree plantation drive. I am Gurgaon has also been working closely with the local Municipal Corporation to Develop the Aravali Biodiversity Park. Sri M urged everyone to develop a special relationship with trees, nurturing and helping them to grow as fellow living beings, which would in turn promote spiritual growth. He said Maitri meant developing amity with trees and MyTree indicated adopting at least one tree and looking after it. Has no desire to move or acquire but to give. He said there was no right, left or centre ideology that brought people to loggerheads on this issue and promised to do whatever he could to promote afforestation initiatives across the political spectrum.